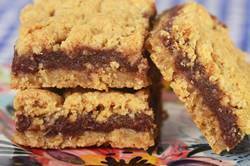 Date Squares are also called Date Slices or even Matrimonial Bars. They consist of two buttery layers of an oatmeal shortbread crust that are sandwiched together with pureed dried dates scented with vanilla. Growing up, Date Squares were a regular part of my mother's baking. Yet once I got married I somehow forgot all about them. It wasn't until I was browsing through Rose Carrarini's inspiring book "Breakfast Lunch Tea" that I discovered this delicious square once again. I just love their wonderfully sweet yet earthy flavor. Absolutely perfect with a hot cup of tea. As their name implies, the main component of Date Squares is dates. Dates are the fruit of the palm tree, that grow in large bunches, with each date measuring up to 2 inches (5 cm) in length. They have a high sugar content and are also a good source of protein plus Vitamins A & B. For this recipe we are using dried pitted dates and I usually buy the ones that are packed in plastic containers. You can often find them in the produce section of your grocery store. To make the date filling, the dates are first cooked in water to soften their tough outer skin. We then add a little vanilla extract (could also add a little orange or lemon zest) and let them cool before pureeing in a food processor or blender until fairly smooth (a few lumps are okay). After that is done, we need to make the oatmeal crust which, again, is easily done in the food processor. This is really an oatmeal "shortbread" crust. It has a fairly high butter content and there is no egg. For this recipe I like to use old-fashioned rolled oats rather than quick-cooking as I prefer their thicker texture and flavor. Also, make sure that your butter is cold and cut it into small cubes. Pulse the butter into the flour mixture until the mixture just begins to come together. Then the layering of the ingredients begins. First, two thirds of the oatmeal crust is pressed onto the bottom of our pan. The date puree is then spread over the crust and then the rest of the dough is crumbled over the dates. Gently press down to compact the top crust. The squares are baked until golden brown. The longer they bake the more crisp and chewy they will become. To make it easier to cut these squares, it is best to chill them first. Date Squares will keep up to a week in the refrigerator. Next, preheat your oven to 350 degrees F (180 degrees C) and place the oven rack in the center of the oven. Butter (or spray with a non stick cooking spray) a 9 inch (23 cm) square baking pan. Line the bottom of the pan with parchment paper. Oatmeal Crust: In the bowl of your food processor, place the oats, flour, sugar, baking soda, salt, and ground cinnamon. Pulse to combine. Then add the butter and pulse until the mixture is crumbly and just begins to come together. Press about two-thirds (450 grams) of the mixture onto the base of the prepared pan.